The Paris edition of the Grand Chess Tour 2016 opened in Paris on Thursday, a day and half before France defeated 10-man Romania in the Parisian suburb of St. Denis. In fact, some people were lucky enough to take part in both, including Magnus Carlsen, who after the second rapid chess day made it to Stade de France. He was clearly thrilled at the host country’s victory following Payet’s last-gasp wonder strike and earlier assist to give his country the lead. High on emotion the world champion sang a song about Payet being ‘better than Zidane’. The Norwegian was also happy with his rapid play over two days, stating that both his play and his results were good. Despite which Nakamura is in the lead. The American was the only undefeated player after nine rapid games. Carlsen had at this point repeated his experience from Stavanger – his only loss came after his time ran out in the first round. Nevertheless, the table here is temporary, prior to Saturday’s and Sunday’s double-round blitz games to be played in the traditional +1 =0.5 -0 system, with the points to be added to those from the rapid games. 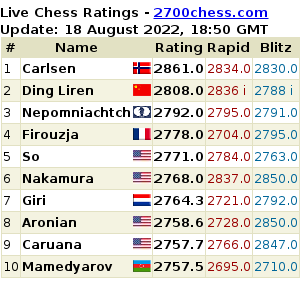 See below the rapid games with Carlsen and Nakamura. The third set of games in the Paris leg of the Grand Chess Tour finished on Saturday evening, just as Wales were getting the better of Slovakia in Bordeaux. As a reminder, the points from the blitz games are added to those won in the rapid games. Another two games of Round 1 of the Alekhine Memorial finished decisively: Michael Adams defeated the reigning world champion Vishy Anand; Kramnik outplayed Nikita Vitiugov. 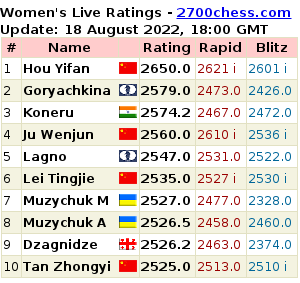 A bit earlier Ding Liren beat Levon Aronian. The Australian Women's Masters is taking place at Melbourne Chess Club as part of celebration of the 150th anniversary of the Club. Prior to it, the facility has hosted 2016 Australian Chess Championship won by Kanan Izzat. This year the Women's Masters is held for the 4th time and the field, according to the organizers, is much stronger than before. The main tournament is a round-robin of 10 rounds. The Hasselbacken Chess Open ended in Stockholm. With over 300 entrants the names of most players are fairly unknown, but the list of top rated players was impressive: Dmitry Andreikin, Alexei Shirov, Zoltan Almasi and others.